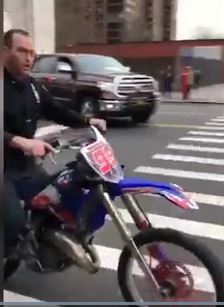 Earlier, the officer and his colleagues were trying to arrest a man who according to them was driving recklessly on a dirt bike. The man ditched the bike, jumped on the back of another person’s motorcycle and fled away. The police officer was bringing the dirt bike to the precinct when the accident happened. While they should lead by example, a recent investigation by Streetblog NYC found out that many NYPD officers who are supposed to be Vision Zero ambassadors are indeed driving recklessly in the same neighborhoods they are supposed to protect. Streetblog investigators found that “when comparing regular drivers to cop drivers, police officers drive their regular car twice as recklessly as regular New Yorkers“.